Some girls look forward to buying new clothes when seasons change. I live for the new produce! There is just something about specific foods that ushers in a season for me. 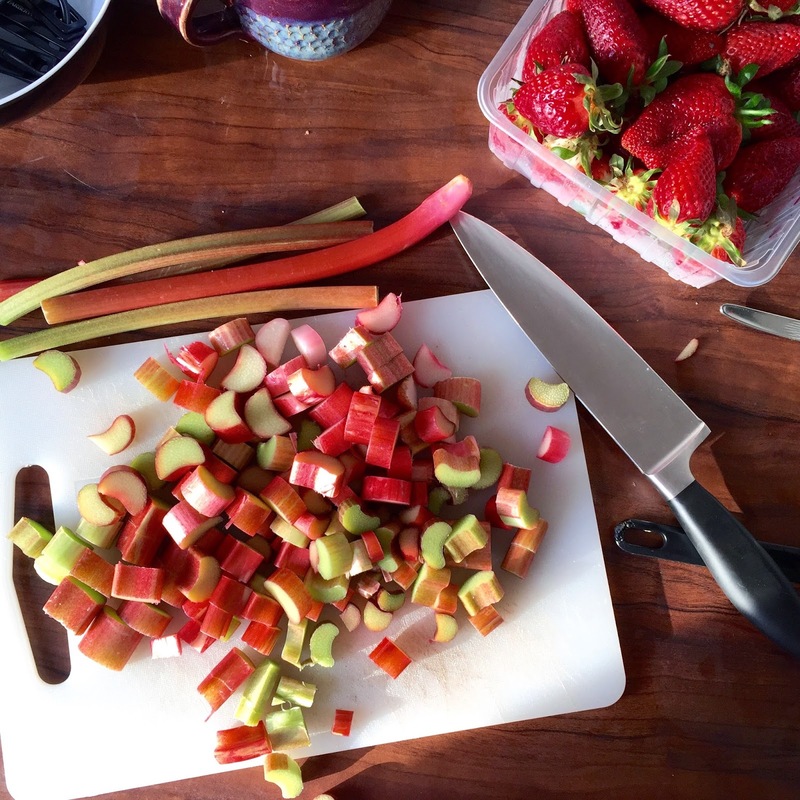 As much as pumpkins and apples equal fall, asparagus and rhubarb are spring. 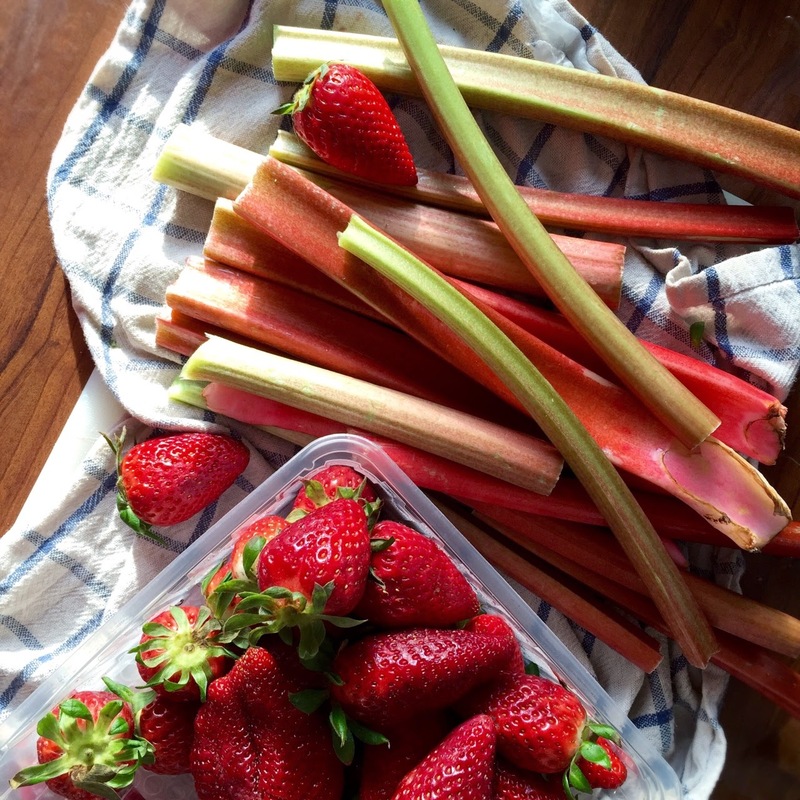 When I saw a big basket of ripe strawberries and rhubarb on sale, I knew Frankfurt had finally said goodbye to winter! Rhubarb never seems to stick around long, though, so I grabbed two bundles and went on my merry way. The only thing left to do was bake a crumble. As far as I am concerned, once baked goods are in the house, they are fair game for any time of day or meal. With that in mind, I decided to make this treat at least semi breakfast appropriate and went with an oat, walnut and coconut streusel topping, which is filled with fiber and healthy fats. Oh, and the combination is heavvvennly. 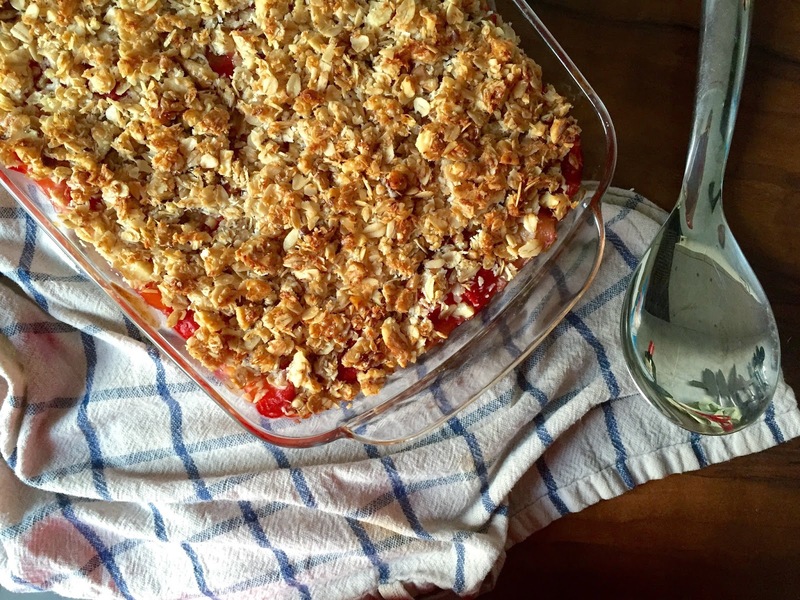 The coconut and tangy rhubarb are so refreshing with the sweetness from the strawberries and honey. The fat from the walnuts and coconut also help ground the flavors and cut the acidity of the fruit filling. I'm also happy to report that no refined sugar was used and that this dish is gluten free. Hope you enjoy it as much as I do! 2. In a large pot on medium heat, add 1 T. coconut oil and rhubarb. 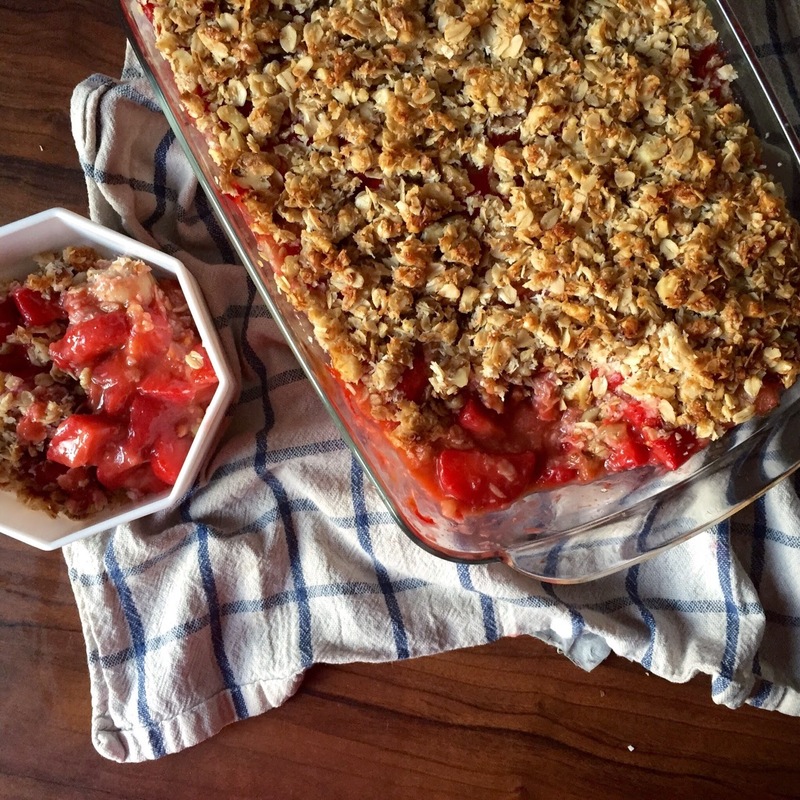 Cook about 5-8 minutes until rhubarb softens, stirring to make sure it doesn't burn. 3. In a cup, mix cornstarch with just enough water to disolve it. Add mixture to the pot and cook for an additional 2 minutes until mixture thickens. 5. 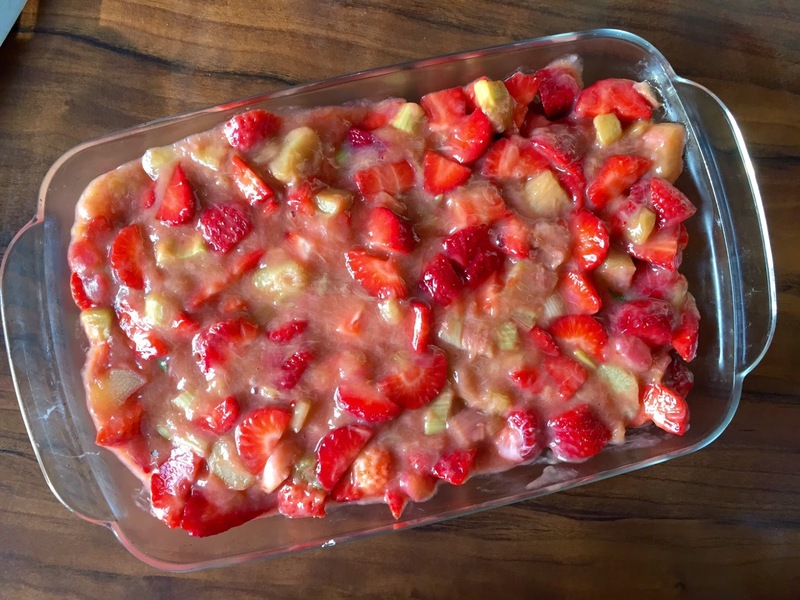 Add strawberries into the pot and then pour mixture into a 12-inch x 7-inch glass baking dish. 6. In a medium bowl, combine all ingredients for the topping and sprinkle over the fruit mixture. Bake for 15 minutes. Serve plain or with yogurt for breakfast, or with whipped cream, ice cream or "nice cream" for dessert!